With the river still above 37 feet, I took this series of photos from the vantage points of Mud Island and the Auction Street Bridge. 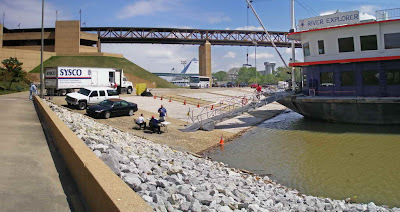 The huge double-barge River Explorer was docked and receiving stores for her next trip to New Orleans. 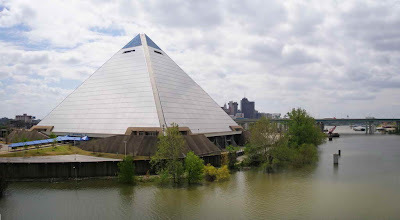 I took these panoramic photos on March 30th and April 2nd, as the river was swollen from recent rains to above 37 feet on the Beale Street scale. This view is looking north from Riverside and Beale. As you can see from these two photos, the Cobblestones were covered by water all the way to the Riverside retaining wall, from the stairway south. North of the stairway, a narrow stretch of Cobblestones remained "dry" - except that the day I shot these photos it was raining. The weather was only getting worse so I quit for the day, returning April 2nd for the rest of the photos. Looking south from Jefferson Davis Park. Looking south, from near the riverboats.